Whoa, this is awesome! The already diverse Park Road strip is adding Bombay Street Food, which as the name implies will serve Indian street food. Their menu is pretty extensive and includes traditional Indian dishes, street food and Indian Chinese, a mix of the two cuisines popular in Mumbai. Their website says restauranteur Asad Sheikh was inspired by the street food he ate growing up in Mumbai, and chefs and partners Pradip Shrestha and Dolly Khan just visited the city to try more food and get inspired. Sheikh also opened other Indian restaurants in northern Virginia: Curry Mantra, London Curry House and 1947. 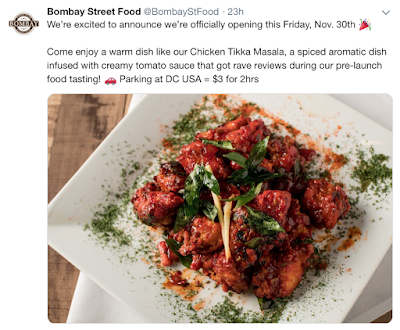 You can follow Bombay Street Food on Twitter for updates too. On Twitter, they say they're opening Nov. 30 at 1413 Park Rd NW, which was formerly Vietnamese Chelsea. I never went, did you like it?